The parish council produces a newsletter periodically to keep you updated which you can see below. WLBC have announced that the options referred to below are to be reviewed and less Green Belt will be taken to build houses but they will not give details of the changes stating "The Council has still to complete its review of the comments" See planning page for more details. This photograph shows local contractor, John Branson, straight after he had installed two fingerposts along Holland’s Lane. These fingerposts have been provided by the Parish Council (with vital 50% capital grant aid from West Lancs. 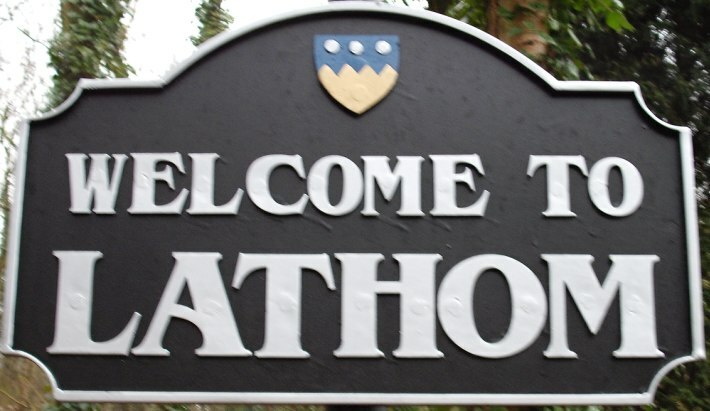 Borough Council) as the first in a project to signpost in an informative way the network of footpaths within the Parish area. 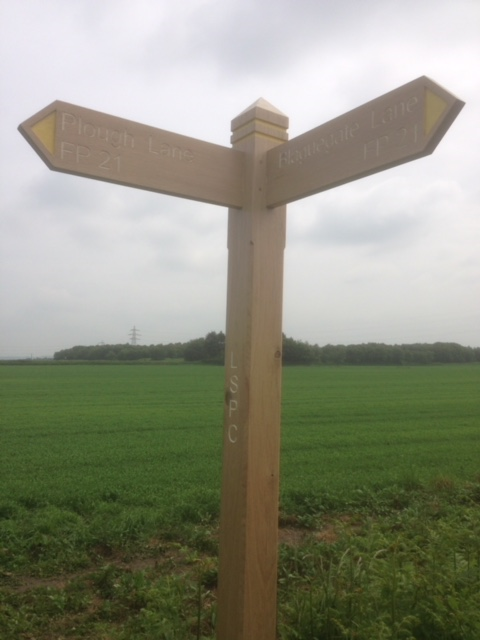 Most of our footpaths cross private land and this Parish Council is extremely grateful to Bickerstaffe Parish Council Chairman, Mrs Hilary Rosbotham, for allowing us to install these two fingerposts on her land. We are also grateful for the ready co-operation of farmer John Appleton and his wife, Mary, in agreeing exact locations which would not interfere with their farming operations. This follows similar co-operation over the location of the Parish bench on Holland’s Lane. In 2013, Tree Warden Andrew Beeston helped Lathom St James plant a Bramley apple tree as part of Tree Council’s Queen’s Diamond Jubilee Tree Scheme. This is one of only 60 Jubilee Trees throughout the whole country, all part of an educational tree planting scheme with children. A commemorative book entitled “Our Diamond Jubilee Gift to Her Majesty the Queen” has been produced by the Tree Council and the Bramley apple tree is included. On 15th July 2015, Chairman, Cllr Alison Whitehead presented the book to Head Teacher Mrs Alison Albion, Tree Warden Cllr Andrew Beeston and the children of Lathom St James Primary School. Huge thanks to Parish Councillor & Tree Warden Andrew Beeston who led the tree walk on 29th August 2015. Beautiful late summer sunshine brought out the ramblers and all enjoyed the guided tour. Lathom South Parish Council has installed a wayside bench for walkers on Halfpenny Lane, a public right of way in Lathom, running from Hollands Lane to the Scarth Hill area. With the kind permission of Mrs Hilary Rosbotham, the bench is sited on the corner of Halfpenny Lane, where it meets Hollands Lane. The bench is the final part of a wider project begun last year to commemorate the Queens Diamond Jubilee and the bench is embossed to denote this. A free hedging pack was obtained from the Woodland Trust and this was planted by volunteers along Lyelake Lane and a Royal Oak tree, also donated by the Woodland Trust, was planted alongside the oak bench. The entire project was completed by the Parish Council with volunteers and the bench was supported by a West Lancashire Borough Council capital grant, so there was very little cost to the residents. Weary travellers can now take a break and enjoy a picturesque view across the Lathom fields. 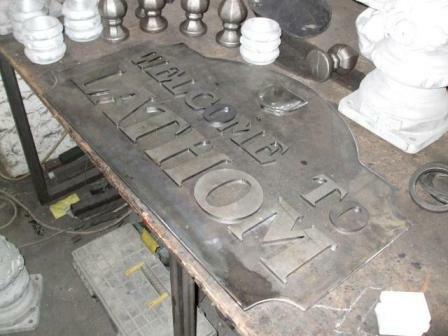 Road signs "Welcome to Lathom" have been erected in 11 locations to mark entry into Lathom and to finally establish the full area of Lathom. Again there where many hurdles along the way. Our original plans to have solid cast iron poles had to be reviewed after consultation with the Highways Authority. Being new signs they are subject to the latest Health and Safety guidelines: which means that poles have to bend so that if hit by cars the impact is reduced for the occupants. We also had to change some of our chosen locations so they did not interfere with other road signs or lines of sight. In some instances they had to be placed on the opposite side of the road, but we had no choice in this. The important thing is that we have established the full area of Lathom. We hope you like the signs.